George P. Dempsey was born July 19, 1929 in Philadelphia and grew up in the Camden County borough of Merchantville. He had a brother, Robert, and two sisters, Ruthann and Doris. A good all-around athlete, George used his size, speed and leadership skills to greatest effect on the hardwood. In 1947, playing point guard, he led the Merchantville basketball team to victory over Weehawken to win the Group II state championship. George attended King’s College in Belmar. The school, which has since relocated, featured a faith-based academic curriculum, but fielded very good intercollegiate teams. George, who stood a bit over 6’2” and weighed 190 pounds, distinguished himself as one of the nation’s top small-college scorers. 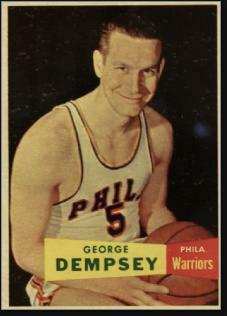 The Philadelphia Warriors’ scouts saw enough of him to grab him in the next-to-last round of the 1951 draft. George played pro ball in Philly, but not for the Warriors. At least not right away. He was a part-timer for the semipro Philadelphia SPHAs (which stood for South Philadelphia Hebrew Association), a club that had a long association with Eddie Gottlieb, who owned and coached the Warriors. George joined the big club for the 1954–55 season. The Warriors were led by high-scoring Paul Arizin and hook-shot artist Neil Johnston. George backed up playmaker Jack George and saw action in 48 games, averaging 7.3 points per game. Philadelphia finished with a losing record, but the 1955–56 team received a huge boost from La Salle rookie Tom Gola and shed some of the dead weight from the year before—including longtime coach Eddie Gottlieb, who gave way to George Senesky to exclusively run the business of the team. The result was a 45–27 record and first-place finish. George’s minutes were reduced slightly, but he was a consistent contributor to the Warriors’ championship run. He was one of the NBA’s most accurate shooters at 47.5 percent and played shutdown defense across 72 games. He had big scoring nights against the Lakers and Celtics, but mostly he was the second or third man off the bench. In the playoffs that spring, the Warriors defeated the Syracuse Nationals 3 games to 2 in the East finals. George had a personal-high 10 points in Game 3. Philadelphia went on to beat the Ft. Wayne Pistons 4 games to 1 in the finals to capture the NBA Championship. After retiring, George bought a house in Pennsauken, where he and his wife Doris raised five children. He stayed involved with local basketball. His grandson, Pete, played baseball for Temple and was drafted by the Phillies.